Update: This model has also been confirmed for Australia and New Zealand, with a release date alongside the game of 17th May. The May arrival of Kirby: Triple Deluxe is no doubt on the radar of plenty of 3DS owners — it hits North America on 2nd May and Europe on the 16th. While the latter region has to wait an extra two weeks, Nintendo of Europe is keen to ease any disappointment by releasing an all new 2DS design to accompany the pink one's latest adventure. The Pink + White model pictured above is actually different from the Peach Pink 2DS coming to Gamestop in North America next week, as pink is the main colour of this model. It certainly matches up nicely with the hero of Triple Deluxe and will arrive in stores alongside the game; a new silver carrying case will also be available to buy separately. As previously announced Triple Deluxe will also have bonus games, including Kirby Fighters which supports Download Play. You can check out a new trailer for Kirby: Triple Deluxe below. Are you excited about this one and, if in Europe, are you tempted by the new 2DS model? We'll keep an eye out for an equivalent hardware reveal in North America. I'm glad this isn't Kirby branded otherwise I would have had to buy it. Nice to see it on this side of the pond (shame I don't need a EU 2DS at all). Then again it is not a surprise as pink systems fulfill a niche. @Brickbuild101 The 2DS does not come with Kirby. I just think NOE wanted to release it and did not care about the Disney branded bag (a plus). I want a new 3DS XL, and I have a feeling there will be a few nice ones coming in the Summer, so holding on to my red xl for now. No interest in the SSB4 game on 3DS or WiiU but I would think they will bring a sweet SSB one whenever that comes out. Would have gotten the Zelda gold XL last year but I didnt have the money at the time and I have the game now (and finished) and I have kinda gone off that one now for some reason, its still nice, but not for me. Extremely lazy hope an XL version will look better. I preferred the pink buttons version but I already have an XL so wouldn't be buying anyway. I wonder how many people interested in this game would actually want a pink 2ds. @Interneto you are right of course! Maybe my son can take hers, he loves it, and we'll get her this for Christmas or something! Even though I'm a guy, and people seem to frown upon us liking pink, I think this looks really nice! 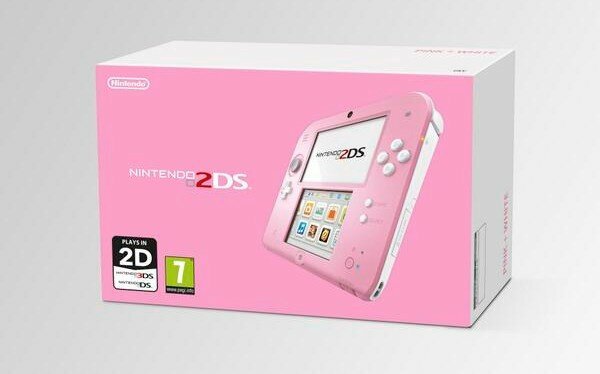 If this comes to the US I'm going to have a hard decision as to which pink 2DS to get my daughter for her birthday: This one or the Peach Pink model. No love for Americans, eh? @Neko_Chan, how so? Americans get the Peach Pink 2DS, which I'm sure EU does not.